Forest City Fashionista: Dahhhhhhling, I'm Your Auntie Fashionista!!!! Several months back I wrote a post about my thoughts on what made for a meaningful life, and mentioned that I had completed the training required in order to volunteer as a Big Sister. I had been looking forward to mentoring a young (or teenage) girl that needed an additional positive role model in her life. Well, unfortunately, it was not to be. The agency tried for several months to find me a match, and was only able to find one girl that lived in close enough proximity to me to make it feasible to plan outings. When she and I met, it was clear that I really had no idea what most 12 year old girls like to do, and that my expectations needed adjusting. I consider myself to be in relatively good shape, but my physical limitations became glaringly obvious when discussing what my potential little sister hoped to do on outings with me. I was hoping to do crafts and go to the library; she wanted to go swimming and tobogganing, and we agreed we were not going to be a good match. Unfortunately, Big Sisters was not able to find any other potential matches for me, even when I widened the age range that I was looking for. I was very disappointed, and it's hard not to take that kind of thing personally. I knew that my age may make matching difficult, although I was re-assured that they have big sisters of all ages. I realized that I had been hoping to find a little sister who was like me when I was that age - a bit of a weirdo, so to speak. I'm sure that kid is out there somewhere, and I hope she finds a cool Big Sister, even if it won't be me. I skipped the Mother thing, which means I won't be anyone's grandmother. I have no siblings, so I won't be anyone's real Aunt, but I do think I would be an awesome Crazy Aunt - every kid needs one of those, right? I'd been laid low with some kind of cold/flu thing for a few days, but felt well enough by Saturday night to go and watch my bestie and the rest of the Timber Rollers play against the Hamilton Eh Team. 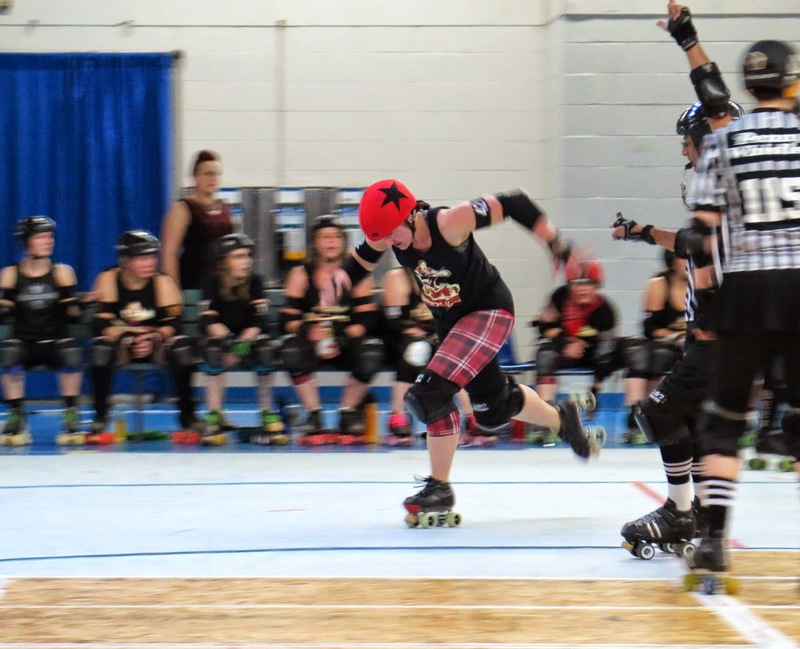 That's Heather (aka Torquemada) seizing the lead jammer position. It was a good game, both teams played very well, but the Timber Rollers triumphed in the end. I had also wanted to go because these kids were playing the half time show. You may remember me singing the praises of Populusque Romanus in a couple of previous posts. 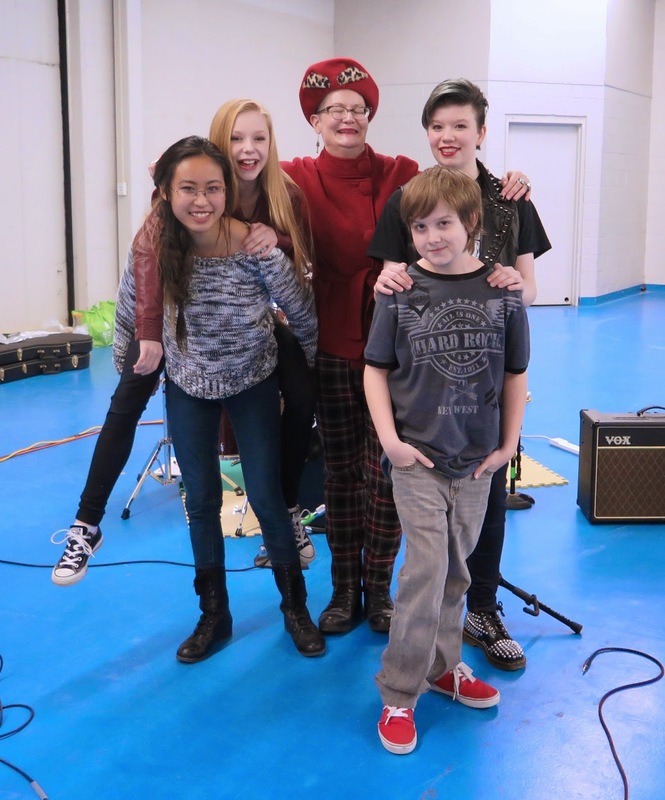 From left: Queena Liu on guitar (also keyboards), Lucy Grant (drums and vocals), Grace Grant (lead vocals and guitar) and Connor Elgie (bass and keyboards). The guy in the background is Lucy and Grace's Dad who is the band's dedicated Roadie. Even though it's only been about eight months since I first saw these kids play, they get more mature each time I see them. The girls are wearing lipstick for heaven's sake! 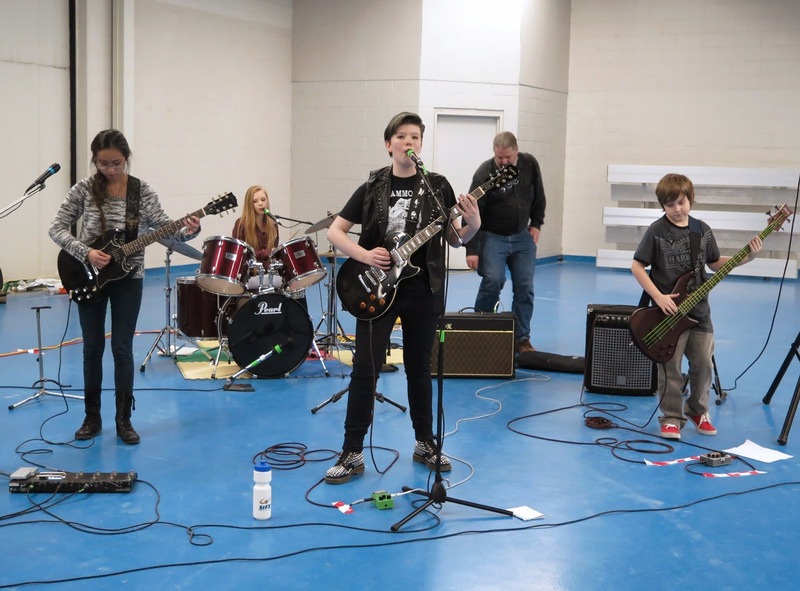 Lucy, usually the quiet, unflappable presence behind the drum kit surprised us all by singing "House of the Rising Sun", adding vocalist to her list of talents. I've met all their parents and they are so supportive of their kid's multiple creative endeavors. If it's not enough that they are all very talented, they are also just so damn nice! They put up with my potentially embarassing Fan Girl behaviour at their gigs and constant photo-taking; I was asked more than once by another audience member if I was their mother. From now on, I should reply, "No, I'm their crazy Aunt!" I'll end with this photo in which I look like I've just been goosed, but is a great photo of the band. I think this shot was snapped just as I realized that my ring was caught in Queena's hair. Thanks to Karen Grant for taking the photos. If you're in need of a crazy, hat-wearing Aunt to round out the table at family gatherings, let me know and I'll check my calendar! I think you would be an Amazing Crazy Aunt! There is definitely a young girl out there somewhere missing out on a wonderful opportunity. How very sweet of you to sing the praises of Populusque Romanus. 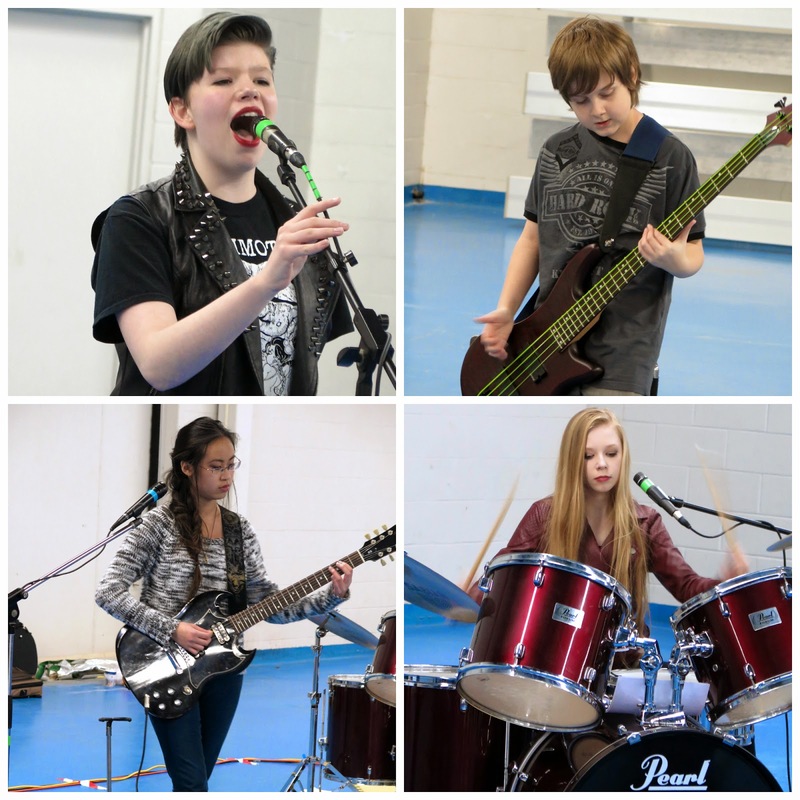 I am a wee bit biased when I say that I too agree with you…they are 'damn nice' kids and very talented. There are so many weird and wonderful kids out there that need a big sister. I can't believe there isn't kid like that in their program.....Aw shucks! You would be a super special big sister. 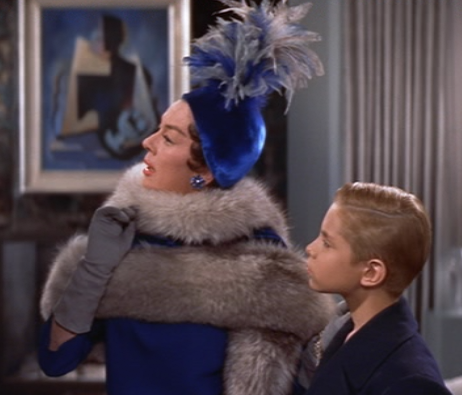 We take exception to you calling Auntie Mame crazy. Eccentric she was; non-conformist she was, but crazy, no. If only Mame had been our auntie! Think of all the wonderful hats she would have lent us! GIVEN us, even! As for you, having met you we take exception to you calling yourself weird. Eccentric yes; non-conformist yes, but weird is the word people use when they don't have a clue. And that's a killer hat, by the way. LOL I am the crazy aunt. My sister has already informed me that her eldest (who is all of 12) has told me she doesn't want to have kids and wants to be just like me. Much to the dismay of my sister. Of course I thought it was hilarious. It is good that you can be the crazy aunt to the band members and help promote them at the same time. LOVE the hat! welcome to the wonderful world of Crazy Aunts! I'm a Crazy Great Aunt, too. If you just keep showing up at Populusque Romanus' gigs all the time, you can be their groupie AND crazy auntie! They're amazing - I'm especially impressed with the vocals, and I love seeing girl drummers. What Val says! I'm a fan now too! They'll have a whole slew of Crazy Fan Aunties! I want to be a lead jammer too! In a band or in a roller derby like Heather. Great band video on YouTube by the way. PopR is going places! Anyone would be lucky to have you as their Auntie. Wouldn't you have just fainted if you had an aunt like you when you were a kid? Someone to show you the ropes, wear great hats, find all the cool stuff? Wow. 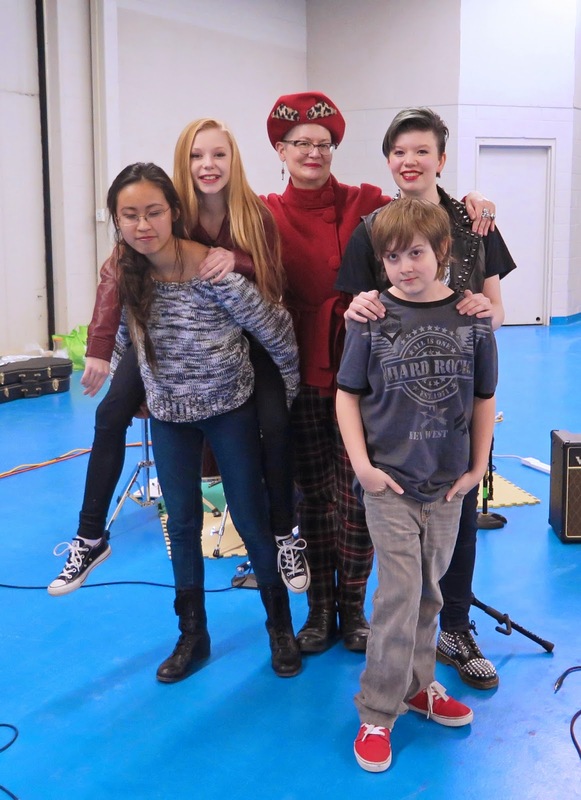 I love the picture of you Aunt-ing with the band. Hahaha. Excruciatingly wonderful hat, especially when worn to roller derby. Who wouldn't love to have you as their aunt? I think it would be life changing! You would have incredible influence in the hat wearing category, plus, you would be fun, interesting, cool, and the list goes on. The band is amazing and I'm sure we will see more of them. With you as their spectacular fan! well, sorry about your mentoring project, actually it's difficult to connect with teens or children, particularly for me!. But I'm also getting ready to be a Crazy Aunt, with my best friend's children and with Mr.A. 's nephews too!. They're toddlers today, but I'm having some Plans, mwhahah. And love to watch that band, they rock!!! And you're going to rock as a Crazy Aunt, yes, you've got a Fabulous Attitude! We've got some of those fun "out there" kids at Original Kids, and there are lots at Beal Art, I'm sure you'll find yours to mentor, being open to it is the big step, hope they find you. 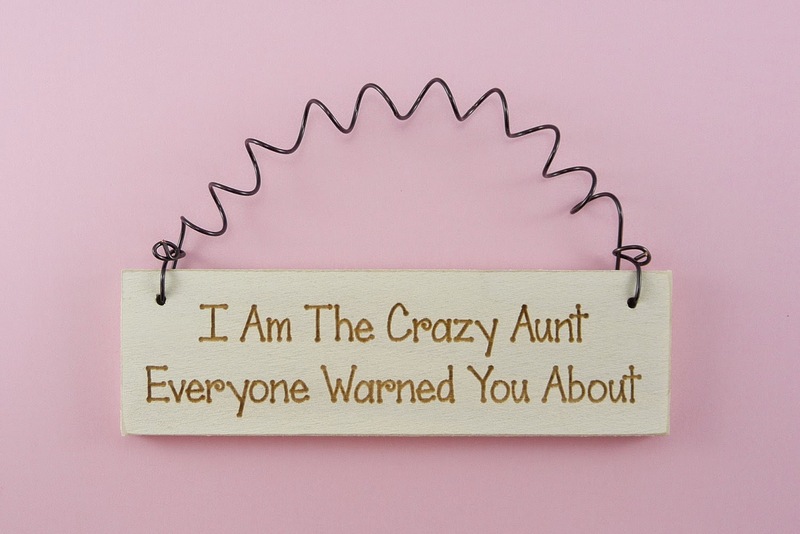 So many kids need a crazy Aunt. Just somebody who doesn't judge and who you can ask every question. So many children in homes love a caring person. What a pity they couldn't find you a match. Too much red tape?